Kenyan agri-tech startup Twiga Foods, which connects smallholder farmers in rural areas to informal retail vendors in cities, has raised US$10 million in funding from the International Finance Corporation (IFC) and TLcom Capital. Twiga Foods, which secured a US$10.3 million Series A funding round last year – is a business to business food distribution company that builds fair and reliable markets for agricultural producers and retailers through transparency, efficiency and technology. Its platform uses mobile technology to match supply and demand, aggregating market participants and finding buyers for farmers’ produce. The latest round of investment was co-led by IFC and TLcom, a pan-African venture capital firm, with participation from previous investors Wamda Capital, DOB Equity, 1776 and Adolph H Lundin. As part of the deal, Wale Ayeni, who leads IFC’s venture capital activities in Africa, and Maurizio Caio, managing partner at TLcom, will join the board. “The IFC and TLcom investment will enable us to reach more farmers, improve efficiency in service delivery and increase access to high quality produce and foodstuffs for vendors. 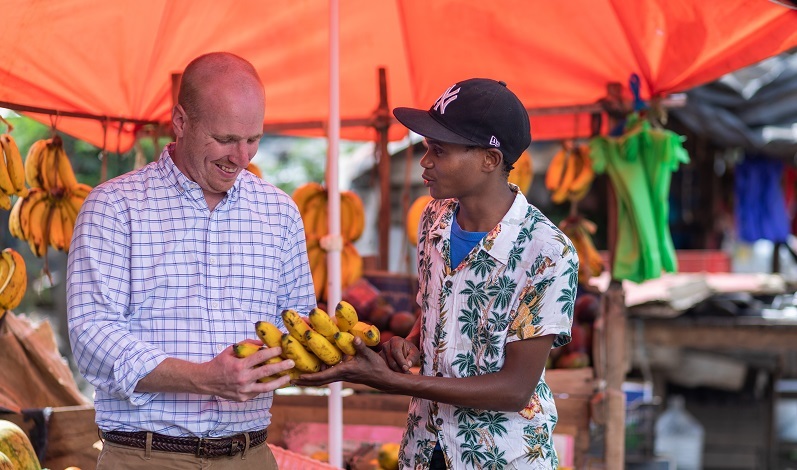 We will continue in our mission to provide affordable, quality, and safe food to Kenya’s urban consumers, and reliable markets for farmers across the country,” said Grant Brooke, chief executive officer (CEO) of Twiga Foods. Twiga will use the new investment to expand operations and offer new services. Since it launched in 2014, it has grown to work with over 13,000 farmers and 6,000 vendors in Kenya. The company initially started off matching vendors to banana farmers, but now works with other produce such as tomatoes, cabbage, mango, potato and onion. Farmers who sign up with Twiga receive payment within 24 hours. “Access to markets is a key concern for smallholder farmers across Africa, many of whom live in remote areas. IFC’s investment in Twiga supports our thesis that digital solutions in emerging markets address real time challenges and create more transparency. Twiga is helping to create a more efficient supply chain that connects farmers directly to markets, which also increases their incomes,” said Nikunj Jinsi, IFC’s global head of venture capital.